Principle of plasma | プラズマ技術なら株式会社 P.R.A. There are three substances in the world: solids, liquids, and gases. Depending on the amount of energy, these states turn into a solids, liquids or gases. In other words, by adding energy to the solid, molecules that make up substances can separate and move freely. Depending on movements of molecules, the state changes from solid to liquid to gas. Gases have the most energy in the three. 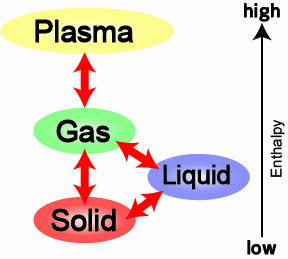 By further adding energy to gases, states of molecules change and the gas changes to plasma. For example, the gas is heated(heat energy is added) to several thousand degrees, the gas turns into plasma. Molecules have a nucleus and electrons. In a gas, electrons are close to the nucleus. As energy increases, nucleus and electrons separate from each other, allowing electrons to freely move around. Since plasma contains a lot of free electrons, the current is extremely easy to flow. Semiconductor microfabrication is a technology that enables ultrafine processing by using plasma (about 0.1 nm in diameter). 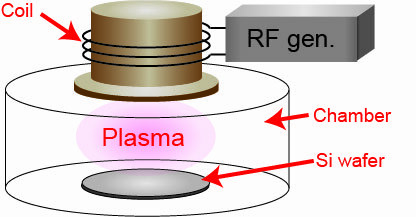 The right figure shows ICP(Inductively Coupled Plasma) which is one of the methods of plasma generation. ICP encloses a gas in the chamber and applies RF to the coil. As a result, magnetic field is generated in the chamber. The magnetic field increases the kinetic energy of electrons and the gas changes to plasma.